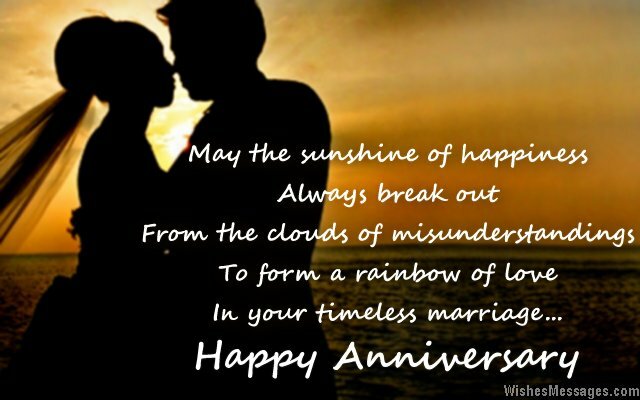 Anniversary Wishes for Couples: A wedding anniversary is symbolic of the fact that a couple’s relationship has sailed through life’s stormy waters. This post reverberates the emotions and feelings that go into making a marriage work. Take ideas to write your own messages to wish a couple who is celebrating their cute bond. Whether it is a romantic quote or a funny joke – make sure that the words on your greeting card mimic the eternal ad beautiful effervescence of true love. Tag them on Facebook and share sweet stuff on Pinterest. The whole idea is to let the couple bask in the warm hues of a milestone celebration that becomes yet another precious memory in the book of their lives. 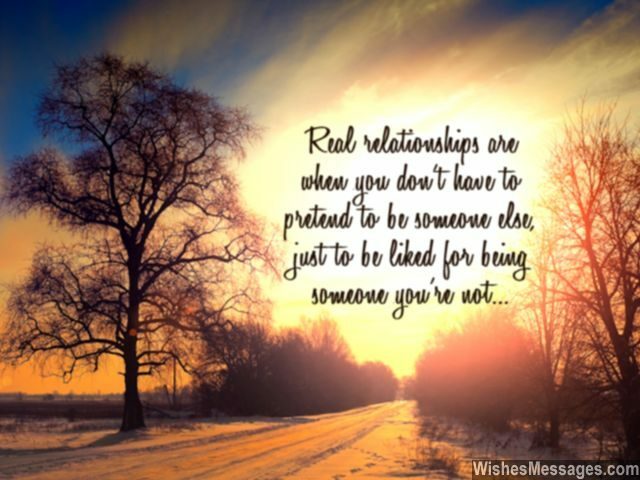 1) Real relationships are when you don’t have to pretend to be someone else, just to be liked for being someone you’re not. Happy anniversary. 2) Looking at divorced couples make me feel that marriages are ephemeral. But you both have proved that marriages are truly eternal. Happy anniversary. 3) Some of the best memories of a couple are not just the magic of their first few kisses but the magic they create every time they kiss for the rest of their lives. Happy anniversary. 4) The wrinkles on your faces are not signs of how much you have aged, but how beautifully your marriage has survived the test of time. Happy anniversary. 5) Not a long journey, your marriage is an adventure. Not a love story, your marriage is an epic tale of romance. Not a happy ending, your marriage is a blissful loop of sweet memories. Happy wedding anniversary. 6) No one and nothing in this world is perfect, but the two of you are as close as it gets. Happy anniversary. 7) Parties, dinners and get-togethers – we have many selfish reasons to gather and wish you both a great life ahead. Happy anniversary. 8) The bond of a marriage can take various forms, depending on whether life is imitating calm or storms. Sometimes in can be a beautiful knot, sometimes it can be a fragile cord. Regardless of what it is, I hope your lives overflow with bliss. Happy anniversary. 9) The echo of your love and the sound of the sea have a few things in common – they are both constant, soulful and eternal. Happy anniversary. 10) Real relationships are when you can fight like enemies, laugh like best friends and love like soul mates. Happy anniversary. 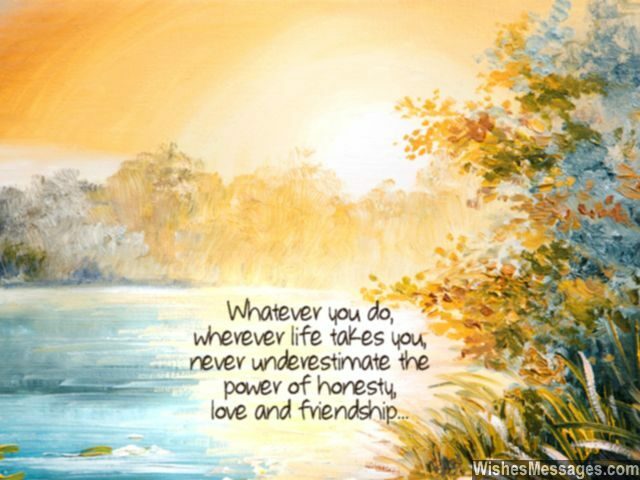 11) Whatever you do and wherever life takes you, never underestimate the power of honesty, love and friendship. Happy anniversary. 12) Relationships are not about give and take, they’re about share and care. Happy anniversary. 13) For some people, a perfect marriage is a myth, fairytale, legend, fable or false hope. But for me, it is a real thing which exists between you both. Happy anniversary. 14) Your dreams, ambitions and hopes for the future may not be always the same. But the beauty of your marriage is that you both live to make each others’ dreams come true. Happy anniversary to a perfect couple. 15) More than the pop of balloons, flash of lights and shower of confetti – may the sounds of laughter, flashes of smiles and showers of happiness mark your anniversary. 16) Anniversaries are milestones where you can pause and look back at your life – to cherish all the beautiful memories and bind yourselves to all the wonderful promises that are yet to be fulfilled. Happy anniversary. 17) Your family name too should end with EST because it comes after every word I use to describe you as a couple – happiEST, coolEST, hottEST and the very bEST. Happy anniversary. 18) If your love story was made into a movie, it would give The Notebook a run for its money. Happy wedding anniversary. 19) Success doesn’t always come in the form of pay checks and awards. It also lies in smiles that are a result of happy relationships and experiencing the little pleasures of life. Happy anniversary. 20) Most married couples hear each other’s words, you listen to each other’s heartbeats. Most of them admire each other’s looks, you complement each other’s souls. Most of them commit to each others’ lives, you have committed to each others’ dreams. Happy anniversary to an awesome couple. 21) The sweetest of anniversaries are a result of getting through the life’s most bitter moments… hand in hand and heart to heart. Happy anniversary. 22) Times change, people change, but memories remain. Wish you both a lifetime of happy memories. Have a fantastic anniversary. 23) The first few years of marriage are likely to be the best. It is only later that life becomes a test. But the love between you both makes you better that the rest. Happy anniversary and good luck. 24) For some couples, being perfect means being flawless. But for a wise, mature and beautiful one like you, being perfect means accepting each other and making the most of what life has to offer. Happy anniversary. 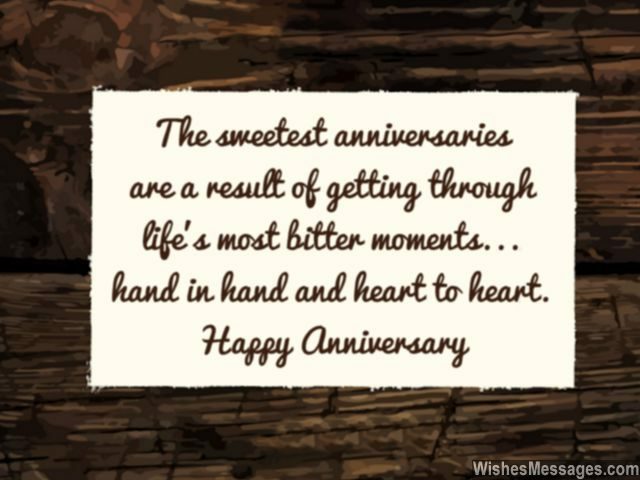 25) Your anniversary should have been a monthly and not a weekly affair, for having just one day in a year is just not enough to show each other how much you care. Happy anniversary. 26) Some marriages are a cocktail of different emotions, feelings and experiences. Yours is straight and on the rocks – 100% pure and undiluted love. Happy anniversary. 27) A romantic journey, thrilling ride, fun adventure, amazing voyage, beautiful expedition, memorable escapade, heavenly trip – this is the definition of your marriage and the path to your destiny. Happy anniversary. 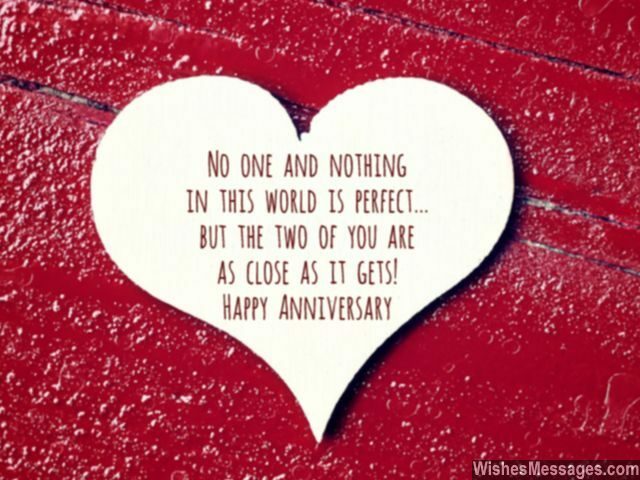 28) Every year, your anniversary makes me anxious, insecure, nervous and stressed because it adds to the pressure of finding the perfect match – just like you both did. Happy anniversary. 29) Sometimes your marriage is slow like Waltz, sometimes it is peppy like Salsa, sometimes it is hot like Tango and sometimes it is soulful like Jazz – cheers to the couple who can dance to any rhythm of life. Happy anniversary. 30) You don’t need to wait for your 10th, 20th or 25th anniversary to celebrate a milestone in your life. 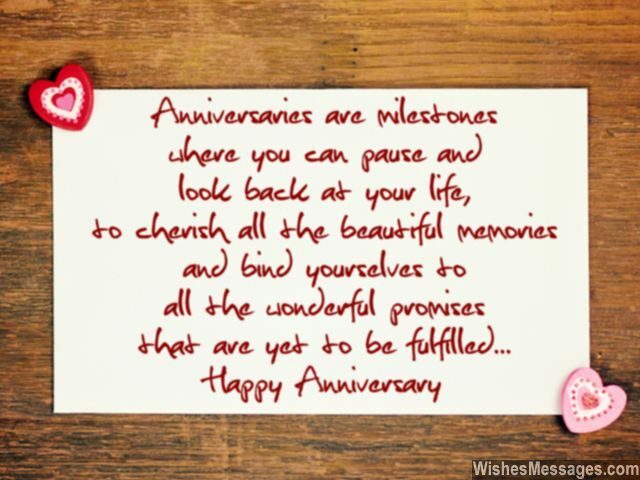 Every anniversary of yours is a special milestone. Happy anniversary. 31) May the sunshine of happiness always break out from the clouds of misunderstandings to form a rainbow of love in your timeless marriage. Happy anniversary. 32) As an old couple your legs may have become wobbly and beautiful wrinkles may adorn your lovely faces, but your love for each other never seems faded regardless of life’s phases. Happy anniversary. 33) Even after so many years of living together, you both haven’t got tired of each other. Here’s wishing that you stay, like this forever. Happy anniversary. 34) Even amidst difficult times, tough situations and harsh circumstances, you have proved that a happy marriage can sail you through any storm of life. Happy anniversary. 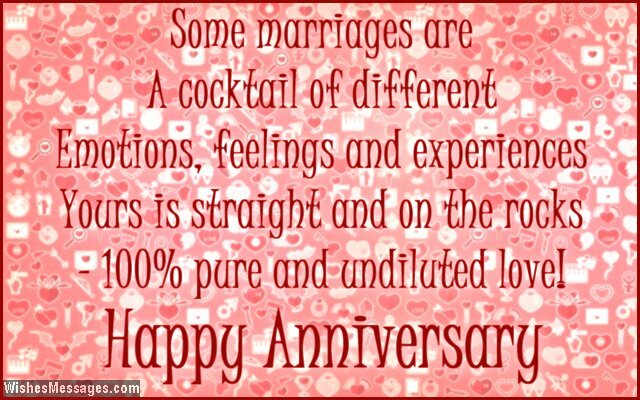 35) Happy anniversary to a couple who has made their marriage as perfect as it is made out to be in romantic books and movies. 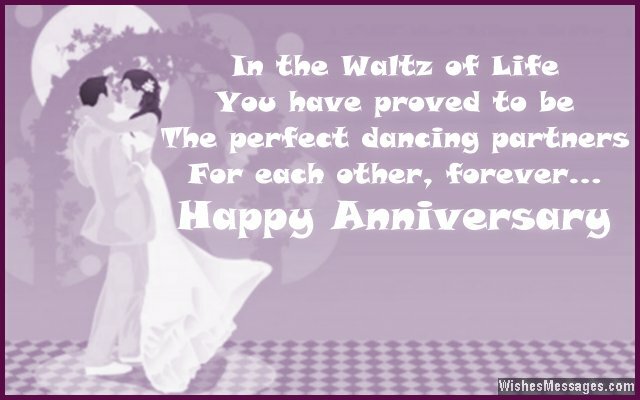 36) In the Waltz of Life, you have proved to be the perfect dancing partners for each other and forever. Happy anniversary. 37) Your anniversary will remind you not just of the best moments of your relationship, but also of all the strife you went through to experience those blissful moments. Happy anniversary. 38) The fact that you don’t behave like a typical husband-wife makes your marriage perfect. Happy anniversary. 39) Good relationships don’t just happen. They need to be nurtured and given a foundation that is unshakable – just like yours. Happy anniversary. 40) A real relationship is when destinies align, souls connect and hearts beat for each other, forever and ever – just like yours. Happy anniversary.